We’d love your help. Let us know what’s wrong with this preview of A Safe Haven by Lilian Gafni. To ask other readers questions about A Safe Haven, please sign up. A moving account of hope and endurance against all odds, A Safe Haven concludes Lilian Gafni's exceptional 15th century trilogy. This third book is both suspenseful and eye-opening in its tragic historical setting. Much of the story unravels aboard ships, from the Western Coast of Africa to the Caribbeans, with Gafni's thorough research painting a vivid, immersive world from Portugal, Spain, Tunisia, the Gold Coast, Senegal and further into the islands and jungles of the Americas. This fast-pace A moving account of hope and endurance against all odds, A Safe Haven concludes Lilian Gafni's exceptional 15th century trilogy. This third book is both suspenseful and eye-opening in its tragic historical setting. This fast-paced and engrossing narrative is expertly told across three threads. The first is a complex depiction of Christopher Columbus' second expedition, together with its often brutal subjugation of Indians, and the Europeans' ruthless quest for gold under much perceived pressure from their Castilian queen. This is no black and white rendition of the Genoese explorer; he is shown with his weaknesses and his strengths. One of the passages in the story, evokes a historical account in which Michele de Cuneo, an aristocrat, took a native woman to his cabin and raped her. The scene hints to Columbus' reluctance to stop him - because de Cuneo had influence with the queen and because at the time, for multiple reasons, Columbus was deeply worried about his good name back home. While casting light on a number of moral dilemmas, the book plants seeds around the notion that history has been unkind to Columbus and that his detractors were responsible for shading his character. Meanwhile, in an engaging second thread, the daughter he has never met, Isabella, finds herself captain of the Liberação and leads often dangerous expeditions to find her long lost husband who has met an unknown fate since a pirate attack in the previous book. Completing several trips between her Sintra farm in Portugal and the Gold Coast, Isabella is torn between her love for Miguel, a love that seems to have little chance since his disappearance, and with letting go of hope to marry the ever attentive and devoted Avram. Isabella grows the most in this book, demonstrating selflessness, courage and the spiritual drive to bring an entire community of Jews to safety in Turkey. My favorite thread was Miguel's. When we first meet Isabella's husband, since his disappearance, it is on the Gold Coast. Toiling under harsh treatment, he works the mines with other shackled slaves in La Mina, a place I took to be close to Elmina (meaning "the mine") in what is now modern day Ghana. Built in 1482, this Portuguese port, the first of its kind, is a grim place that can still be found today. Miguel's journey is one of abject hardship, despair, destitution and all that one can imagine from slavery or the loss of one's identity as a human being. It bore tremendous psychological scarring and for this reason I found it the most emotionally impactful. It echoed the plight of enslaved Indians, or else those captive Indians who died by the hundreds at sea because they were held in festering conditions during their forced journey to Europe, or even the lives of those Africans who in the future slave trade, would be shipped against their will to the Americas. Finally, in this narrative, Miguel's journey was a harbinger of a doom that might very well befall those remaining Jews living in Portugal, if they did not find a safe haven. 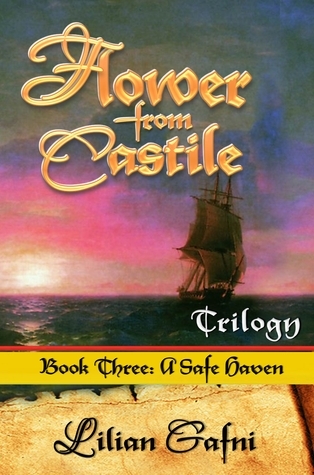 As the third book in this series, it is not necessary to read Books 1 and 2, although the reader would be missing much history, drama, heartache and adventure. Those books reveal how the Jews of 1492 spent most of their lives settling down and then being harassed by the Catholic Church, especially in Spain under Queen Isabella and King Ferdinand, and the trials and tribulations Columbus passed through as he attempted to find the islands of the New World and gold. Queen Isabella financed his trip and three ships on the promise by Columbus that there was much gold and the Catholic faith could be spread worldwide. In this third book, the young couple, pregnant Isabella and Miguel, after having been saved from being slaves by purchase of a rich Jew, the couple get separated and Miguel was kidnapped by pirates again and in the ensuing battle he received a hit on the head and suffered amnesia. As a slave, he had to give a name and he assumed the name Ali (an Arab name). Isabella purchased and captained a ship seeking Miguel. She was convinced he was still alive. She and her family had settled in Portugal, who accepted Jews. Columbus returned to the New World with seventeen ships of farm animals, soldiers, mining materials, and priests to settle this New World, mine the gold by the local Indians and convert them. He suffered many problems. As with the other two books, there is an interchange of chapters, concentrating on either Columbus or Isabella, which may slow it down for the reader, but it is worth it so the reader can live those years of 1492. The author’s research and restructure of history in the form of a novel is well written and I recommend it as an historical novel. Also the author’s real life is almost as interesting and I suggest the reader peruse it on the author’s page on Amazon. I was given this book as a complimentary copy for an honest review. I was delighted with the third book in this trilogy. Lilian Gafni is an exceptional author and this trilogy is exceptional as well. As the first two books were, this too is a page-turner and I found it difficult to put down. I loved the determination of Isabella, her dedication to finding her husband when everyone else was convinced he was dead, her struggle to consider another man in her life as her son needed a father. I admired her perseverance--she is a woman who just doesn't give up. I got an I was delighted with the third book in this trilogy. Lilian Gafni is an exceptional author and this trilogy is exceptional as well. As the first two books were, this too is a page-turner and I found it difficult to put down. I got an up close and personal lesson is history reading this trilogy, one I will not forget. The trials and tribulations on staking claim in the new world, where natives have lived for only God knows how long, was eye-opening. This book could use a lot of editing. It's the last book of a series about the expulsion of the Jews from Spain and Portugal during the inquisition. But this book has tedious descriptions of the islands visited by Columbus, pirates, slaves and slave trade. It would have been more interesting if it hadn't been in such redundant detail. The story of Isabella and her family is charming. And then there is the appearance of Alonso de Ojeda, who "discovered" Curacao. He was in charge of looking for gol This book could use a lot of editing. It's the last book of a series about the expulsion of the Jews from Spain and Portugal during the inquisition. But this book has tedious descriptions of the islands visited by Columbus, pirates, slaves and slave trade. It would have been more interesting if it hadn't been in such redundant detail.